Nigel is an Aviation Consultant and Operator in the Helicopter Industry. He has maritime experience in the Royal Navy and the Luxury Yachting industry and holds commercial helicopter and fixed wing flight qualifications. When I get to London City Airport, Charles my Addison Lee driver – who might have been a radio broadcaster in another life, so silky smooth was his voice – welcomed me back to the city. I listened to his wonderful story about raising two boys that have done him proud in an American University. This is Addison Lee at its best. Arriving at the Sofitel in Gatwick in what seemed like no time at all, I settled into a comfortable and convenient evening, thoroughly enjoying my dinner at the Vanda Gatwick Oriental restaurant in the foyer of the hotel. My British Airways flight in a Boeing 777-200 left in the morning light of London, and arrived in Antigua as the sun was setting. 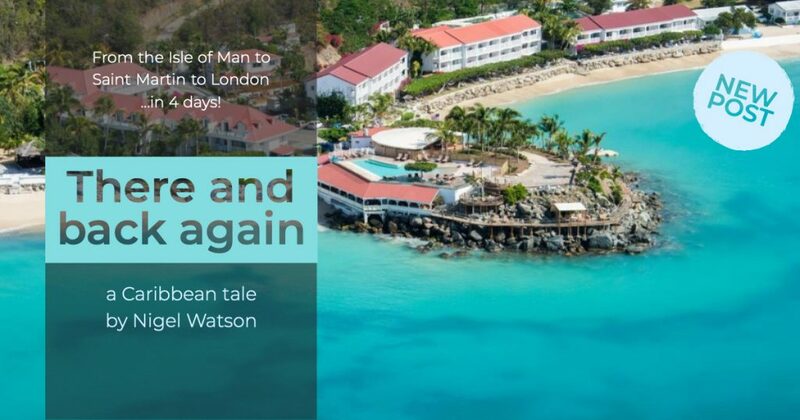 I continued my journey with a night-time flight to Saint Martin in a puddle jumper with Winn Air, where I am met by the grinning face of Cyrille – who did a fantastic job of looking after me during my short stay. This is our 10th anniversary with the Grand Case Beach Club, and they have been amazing to us throughout. My stay there this time was no exception – my suite was almost too much… ‘Almost’, I said! A very special thanks to Steven Wright, Lynn Patrice-Taylor and Jean-Francois Billot. Driving past the devastation of Hurricane Irma from over a year ago, and seeing the efforts the locals are making to get back on their feet was humbling. I’m so pleased we were there to support the Grand Case Beach Club last year. We based our operations there despite the damage, and contributed a $1,000 donation to the staff fund. My daily swim at Grand Case is a great source of joy, and the scenery is absolutely beautiful. I learned that our intrepid band of pilots had done some beach cleaning here, helping to remove some of the debris from Irma that had ended up in the water of the resort. What a great team we have! My first day in Grand Case was spent at the airfield with Cyrille. Our meetings with the Grand Case Airport management team – Pascal Marcoux, Sabrina Charville, and Serge Gonzalez – were a first step to solidifying our presence in the Caribbean. Our hope is to establish a proper base there, like the one we have in Cannes Mandelieu with HeliRiviera. The new maintenance hangar is almost there – a substantial building linked to the tower and fire station. I am hopeful we will see it again in a new light next year from our offices – a new home-away-from-home. In the evening, we walked out from the resort into the nearby town. There is a wide range of restaurants on the main drag. A small group of four in one area offer a slightly different experience. This collective of Lolos is a cheap and cheerful little open-air cooperative offering a variety of excellent cuisines. With such an international crew, spread over several continents, it is always great to seize the opportunity to catch up with them – in this case a lovely meet-up with Andy! As our tech guy, he is helping me with our latest venture into compliance and oversight. I am excited to see whether his web platform can fulfil our needs. And now, so soon after I have arrived, my taxi has come to take me back to the airport. It’s back off to London, and then onward to the next adventure! I will be dreaming of my return to Grand Case. We have many years of experience operating out of the Caribbean, with a network of trusted friends and partners we have met over the years. If you need some advice on how to operate in the area, we can help. We always love getting involved with new projects and meeting new people, so get in touch if you’d like to discuss anything! To find out more about anything in this post, please feel free to 👉 contact us. Nigel Watson discusses superyacht helicopter operations for Yachts Russia magazine. Sarah-Jayne Blakemore discusses the teenage brain on BBC Radio 4.